Dr. David Lee has performed more than 350 Brachymetatarsia One Stage Surgery cases; more cases than any doctor in the United States! A condition characterized by an overlying toe on the foot is actually the result of a shortened long bone of the foot (metatarsal). The condition is a growth defect (not a birth defect) developing with age starting at ages 6-12. This defect increases in severity until bone maturity is reached at around 16 years of age. Patients suffer not only from physical pain on the foot, but also severe embarrassing and emotional injury. Individuals ultimately are forced not to participate in those activities where other will see their feet. Few people outside of those affected understand the depth of this suffering. Having treated hundreds of patients, Dr. Lee knows first hand the liberating effect of Brachymetatarsia Restoration. Patients all over the world now enjoy barefoot summers on the beach, cute little sandals, and relaxing pedicures. Dr. David Lee began working with brachymetatarsia patients in 1995. That year, he performed his first procedure using instruments not designed specifically for bone lengthening. Despite the difficulty, he was able to achieve remarkable results with a few patients. Word of mouth spread to those affected by the condition and by 1997 Dr. Lee was consulting and treating patients every month. In a few short years patients were being treated every week and coming from nearby cities , states, and as far as Europe. Today, patients travel from all over the world to participate in his vision for transforming those afflicted. Surgical Innovation and Evolution- Specialized titanium plates and instrumentation of Dr. Lee's design have enable marked advancements in the technology of One-stage Brachymetatarsia correction. The risks and complications previously associated with One-stage correction are now dramatically reduced making it safer and more effective than External Fixation. Today, patients are able to leave the surgical center after a few hours with their toe length restored instead of waiting months! No fussy, cumbersome and threatening metal bars to adjust. Just a peaceful healing period knowing that your foot is now complete. 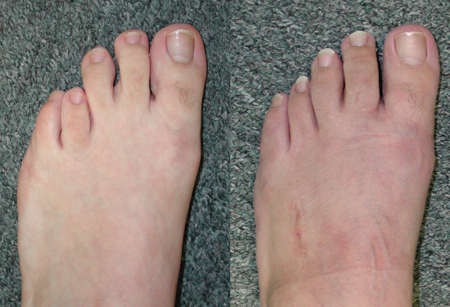 These are actual patient photos of Dr. Lee's Innovative Restorative Foot Surgery™ One-Stage Brachymetatarsia Surgery. The signs and symptoms vary with the degree of severity, age and activity of the person. Although one may not experience any pain or discomfort to the foot, many have tenderness, soreness, calluses or pain to the bottom of the foot in the areas of the foot surrounding the short bone. (photo of bottom of the foot). Another area of discomfort is the rubbing of the floating short toe which makes wearing certain dress shoes or high heels unbearable. Of particular interest is the emotional impact on persons afflicted with brachymetatarsia. After seeing hundreds of patients with the condition, I have yet to see a person who has not been negatively affected by the nature of this pathology. Many have lived all their lives hiding their feet from the public eye. No Pools, beaches, flip flops, sandals, or bare feet. Once the foot bone have matured and the growth plates "closed" no more length of the bones can be expected. This usually occurs at age 16 years old. This is the earliest that one should attempt any type of surgical correction. Dr. Lee specializes in the Restorative Foot Surgery™ One-stage Lengthening procedure of the short metatarsal. Gradual lengthening is performed during the operative period. When the patient completes the 2-3 hour surgery the toe is at the full corrected length. Reduced risk of dislocation or abnormal position of the metatarsal bone. Better cosmetic incision, because the external fixator can leave stretch marks and large circles. No need for a bone graft from the hip bone. A safe, but often painful procedure. Traditional brachymetatarsia surgery performed by most surgeons is done in a multiple-stage fashion where they use an external fixation device to gradually lengthen the bone over several weeks or months (depending on the amount of correction). 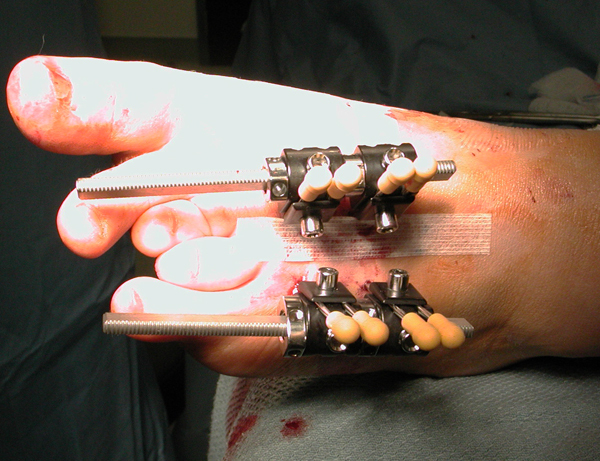 An external fixation device is a scaffolding which is placed on the outside of the foot. The patient adjusts the length of the device to gradually stretch the bone over weeks to the desired length. Typical healing times range from 4-7 months in a cast with the external fixator protruding from the foot. (See Figure 1). Higher risk of infection due to exposed fixation device. Higher risk of dislocation since the bone is soft for 4-6 months and the external fixation device is exposed to impact. You, the patient has to adjust the device and care for the protruding pins at home. Q: What age can my child have this surgery? Surgery for brachymetatarsia can be performed once the bones have matured. This is typically between the ages of 14-16 years old. Surgery should never be attempted before the growth plates close, otherwise the surgery will have to be repeated later in life. Q: Can I do both feet at the same time? With One-stage surgery only one foot can be operated on at a time. The surgery can take up to four hours to perform for one foot. If one were to attempt surgery for both feet that would be 8 hours in surgery under anesthesia which would create a high risk for blood clots or other complications. Q: Are there any doctors in my area that you can refer me to? Unfortunately, there are very few surgeons in the world who specialize in brachymetatarsia and even fewer who routine perform One-Stage corrections. There is no association for those who perform brachymetatarsia surgery so Dr. Lee does not know other surgeons who he can feel comfortable referring to. This is why so many patients throughout the U.S. and across the world come to visit Dr. Lee every month in order to experience this life changing transformation. Q: How much does the surgery cost? The cost for this surgery is based on the complexity of the surgery. Once Dr. Lee has reviewed your x-rays and medical record and spoken with you, he can instruct his staff to obtain an estimate of the surgical costs. Surgery is often covered by health insurances and co-payments would be based on you individual policy. Our staff may be able to assist you in determining your potential out-of-pocket costs once Dr. Lee consults on your case. Q: What is the average length of recovery? With both One-Stage or External Fixation surgery the estimated healing process is 14-16 weeks in a non-weight bearing cast (no weight on the foot using crutches). The specific amount of time depends on how fast your bones heal. This is verified by x-rays taken at 3-4 week intervals. Q: How many cases has Dr. Lee performed? Dr. Lee has performed brachymetatarsia surgeries since 1995 and has performed well over 250 cases. He averages 3-4 cases per month. Q: Why is Dr. Lee able to perform One-Stage surgery when my doctor says that they cannot do it because I could lose my toe? Dr. Lee bases his One-Stage technique on scientific peer reviewed research performed during the 1980's and 1990's. Based on these research papers he modified and improved the technique to prevent and avoid the drawbacks of the published methods. With support of OsteoMed Corporation and Synthes Corporation, Dr. Lee designed and developed instrumentation and custom fixation devices to make available to his patients a consistently safe and effective method of achieving foot restoration. Q: My doctor says I could lose my toe with the surgery. Is that true? Utilizing traditional techniques (which your doctor is most likely familiar with) can potentially cause the blood vessels in the toe to shut down causing a loss to a toe. Dr. Lee's technique, however, avoids the common pitfalls by incorporating a method which stabilizes the vessels during distraction. Additionally, he uses special instruments and fixation hardware to secure your bones in place without the use of steel pins or rods penetrating outside of the body.